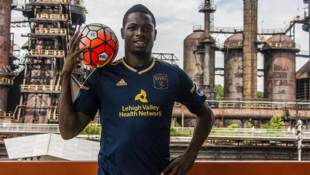 The Philadelphia Union have signed Jamaican international attacker Corey Burke from its wholly-owned USL affiliate Bethlehem Steel FC. The announcement was made Thursday, December 21. He is the first player signed by the first team from the farm team who has no connection to the organization’s academy. Burke is initially expected to take the first team’s third striker slot formerly occupied by Charlie Davies. He will provide greater versatility than Davies did as he also has attacked effectively from the flank, both for Jamaica and the Steel. He signed during the winter of 2016, and then was injured in training with Jamaica that winter thus delaying his Steel debut and slowing his adaptation to the North American game. and through the creative play of Santi Moar and Adam Najem. Coach Burke brought Burke and Conneh into the season opener April 1 against Rochester early in the second half as a striker-winger combination, and they changed an imminent 2-0 loss into a 2-2 draw, until an at-the-death header won it for the Rhinos. Burke should pressure Jay Simpson in 2018 in the same fashion that Conneh pressured him last year. He has a weight advantage against defenders of stature less than Oguchi Onyewu, and uses it aggressively and effectively in addition to his other skills. His departure leaves the 2018 Steel roster at five. Head coach Brendan Burke’s technical staff has now sent four players to the first team roster in two seasons: Home Grown players Derrick Jones, Auston Trusty and Anthony Fontana in addition to Burke. I’m happy for Burke, and I’m interested in seeing how he plays against MLS-level competition. Eriksson is a DP that the quakes paid 1.2 million euros (about $1.5 million). Burke cost the union nothing. I’m going to guess that Eriksson salary is about 10x what Burke will make. If that is your point, that the Union are cheap, ok. I don’t think, however, you can compare Burke to Eriksson. The teams are expecting completely different things from these players. I.E. a DP starter (Eriksson) compared to a third string reserve (Burke). This is on par with the new beer vendor in 108. Remember when they gave away Kevin Kratz to Atlanta for nothing?